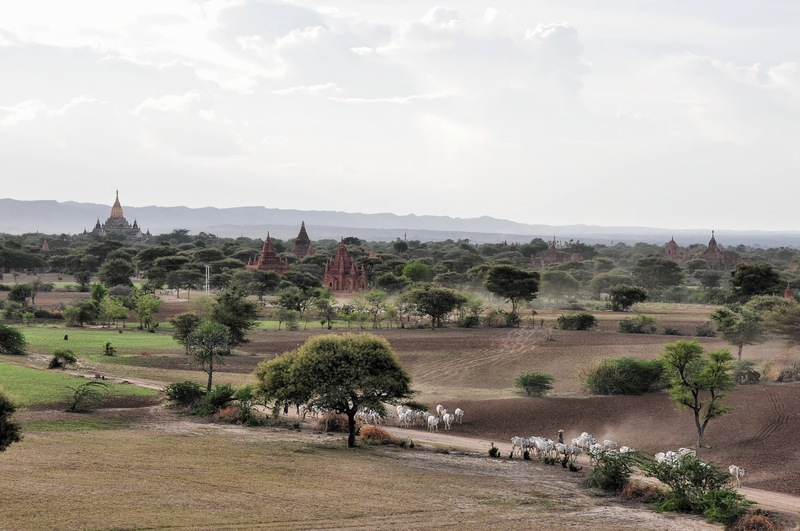 One of the best things about Bagan is its remoteness and lack of tourist hordes. It is a tough place to reach, and therefore you will have much of it to yourself. 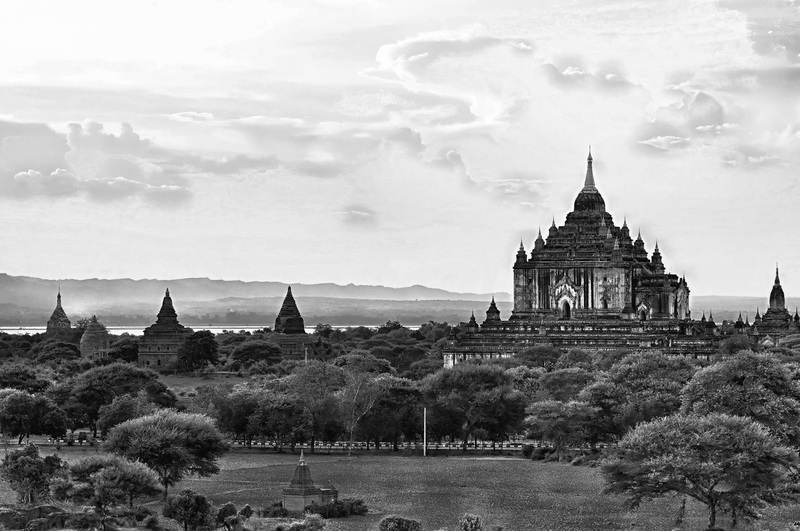 If Bagan existed in a more tourist friendly country, then this would not be the case. This combination of ancient splendor and tepid tourism is unparalleled in the modern world. It makes for great exploration. You are free to take it all in without dodging flappy-hatted loons shuffling off of tourist buses. Renting a bicycle and exploring Bagan brings to focus the completeness and size of this ancient wonderland. The emptiness is haunting and not unlike traveling back in time. Thousands and thousands of crumbling pagodas stretch out for miles – baking in the hot Burmese sun. Find a dirt road and set out in any given direction, stopping to investigate charming ruins along the way. When entering temples, be sure to always leave your shoes or sandals at the entrance, or you risk offending your gracious Burmese hosts. You will meet several kind locals, many of which speak English. Some sell handmade paintings and lacquerware for attractive prices. Near dusk, climb to a peaceful vantage point on a tall pagoda and watch the sun set beyond the ethereal plains. After the sun sets, stop into a local eatery for dinner. Yar Pyi Vegetarian Restaurant is a family run affair and serves delicious vegetarian platters. For lodging, Kaday Aung is a great low cost option with $21 rooms and a nightly puppet show. For an upscale option, Kumudara is a great hotel. Both options have swimming pools. A night swim is a great way to end a day on the dusty plains. Start your day with breakfast at your hotel or guesthouse and arrange for a driver to take you to Mount Popa and the nearby volcanic plug of Taung Kalat. Mount Popa is an ancient volcano reaching a mile into the sky from the flat plains of central Burma. Taung Kalat dramatically erupts out of the earth next to Mount Popa – a striking aberration in the rolling hills and plains. A monastery precariously grips the pinnacle of Taung Kalat and is a popular point of pilgrimage. Gangs of monkeys occupy the 777 steps that slither to the top. The macaques posture for edible handouts and generally cause mischief. At the summit, Popa Taung Kalat Monastery is home to the 37 Great Nats – ancient spirits of Burmese legends. Many of the Nats died violent deaths and have lived on in spirit form atop this steep precipice 30 miles outside of Bagan. The worship of Nats predates Buddhism, though has been widely incorporated into the Buddhist religion, especially in rural Burma. Pilgrims give offerings to specific Nats for specific types of spiritual assistance, ranging from beauty to luck. For example, an offering of whiskey to Min Kyawzwa will give you immense luck in gambling. In life, Min Kyawzwa lived a rowdy life filled with boozy cockfighting and expert horsemanship. The Nats’ place atop Taung Kalat and their worship as ancient spirits is analogous to Mount Olympus and the gods of Greek mythology. The climb is not arduous at all, though bring some water. Since you must leave your shoes at the entrance, you will be humbly sidestepping monkey poo en route to the summit. The views from the top of Taung Kalat are unparalleled, and on a clear day, you can see all the way to Bagan. 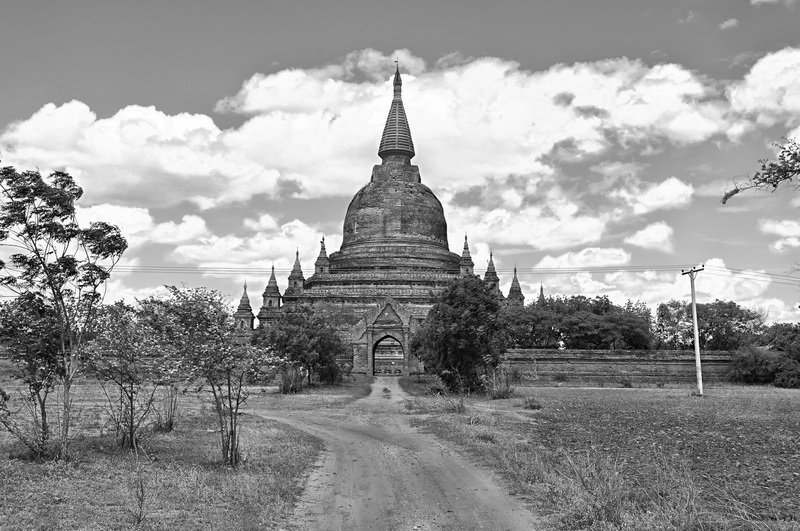 After leaving the Mount Popa area, visit one of the many rural villages that hug the bumpy road back to Bagan. Rural families are extremely welcoming and will give you a silent tour of their iron age cooking apparatuses and moody bovine roommates. Outdoor classrooms are filled with little monks and villagers will offer free handfuls of salty fresh cooked peanuts. 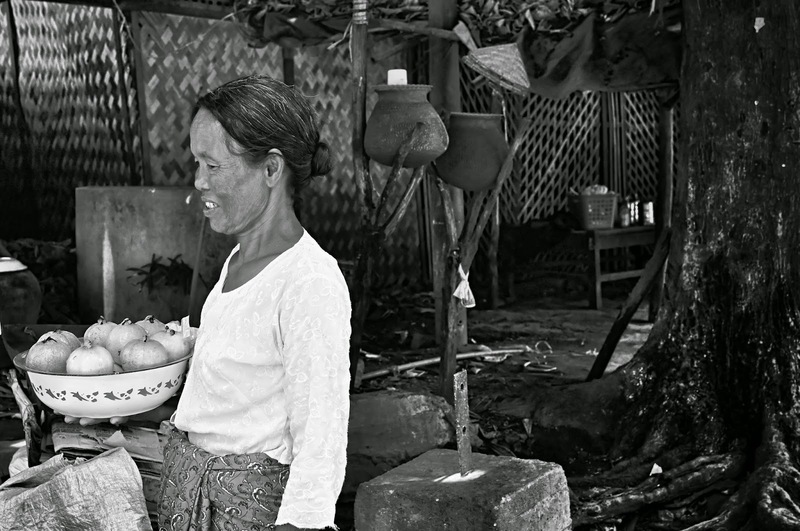 There are many rural delights in small villages where life is undeniably simple. On your third day, hire a local English speaking guide to show you some of the main temples in Bagan. 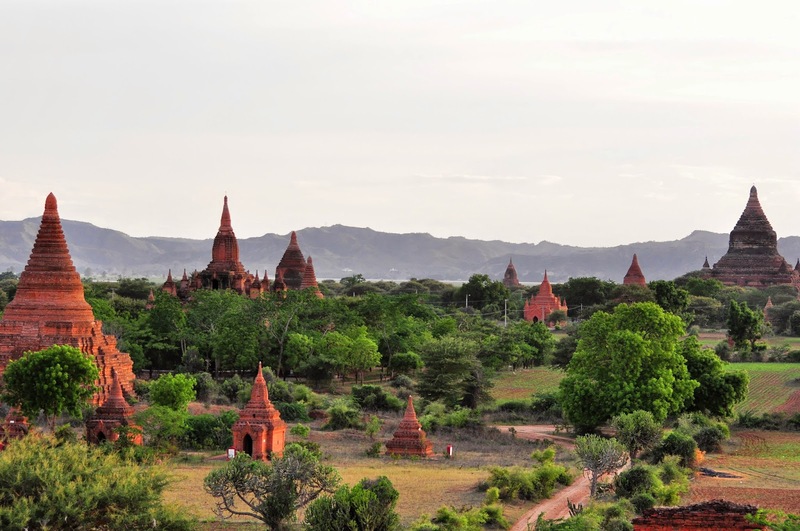 Hiring a local guide is very inexpensive and will provide an informative angle on Bagan’s history. Your guide may also want to indulge in the taboo of discussing the Myanmar political situation. While cruising across the temple scattered lowlands, your betel nut chewing comrade may wax political on a number of eyeopening topics. The setting and topical nature of conversation can make for a powerfully resonating experience. Don’t press the political topic though. Some guides are government employees, or worse, spies. It is wise to err on the side of caution when discussing politics and to let your Burmese hosts instigate conversation. Your guesthouse or hotel will be able to arrange a sufficient guide. 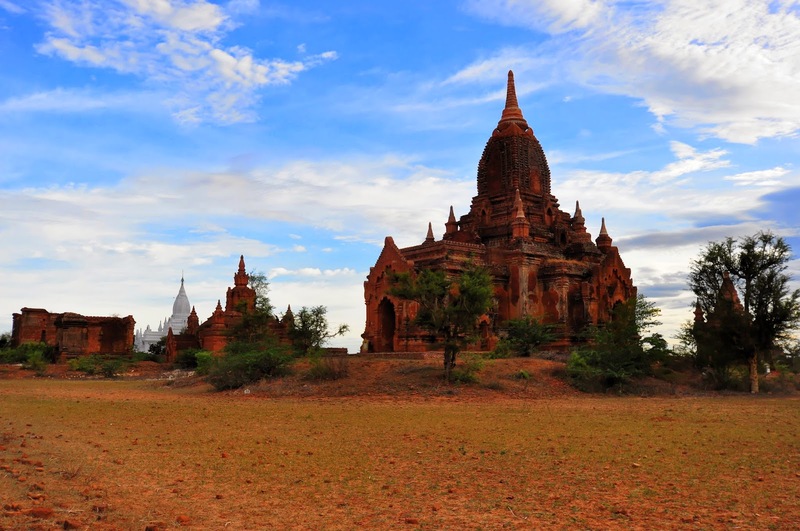 Some of the top temples in Bagan include Shwezigon Pagoda, Ananda Temple, Dhammayangyi, and Thatbyinnyu. Shwezigon houses Buddha’s tooth along with some of his bones. The glittering dome was originally built in the 12th century and is a fine example of a golden stupa. It is similar to Shwedagon in Yangon, except without the crowds. Ananda temple in Old Bagan is almost a thousand years old and done in an entirely different style. The monk architects that designed and built Ananda were murdered by King Kyanzittha after completion to insure that no temple like it would ever be built again. The structure is said to be perfectly symmetrical with an interior ambiance similar to a Himalayan cave. Onward, the massive Dhammayangyi temple is the largest structure in Bagan, but the interior has been mysteriously bricked up. Exploring the larger temples and stupas is a rewarding experience. Your guide can explain the contours of history surrounding each temple, framing the significance of their existence. At each temple, you must remove your shoes and socks before entering. Since many temple grounds have large outdoor areas, your feet will be scorched by the sun baked tile and brick ground. Racing between shaded clearings like a hobbled geriatric is an awkward and humorous component to temple exploration. Near dusk, head over to Shwe San Daw pagoda. Follow the steps up to one of the high terraces for a great view out over the plains. It is the perfect location to watch the sun set over Old Bagan and the Irrawaddy river to the west – a worthy ending to a sidestepping journey through time. American dollars are widely accepted in Burma, but be warned, every dollar is heavily scrutinized and few will be appropriate enough for the intense Burmese qualifications. U.S. dollars cannot be too old or too new. The bills must also not have any creases or markings. The smallest marks, creases, and blemishes are examined like a diamond under a loupe. Of the $1000 I brought with me to Burma, about $200 was in good enough condition to be accepted anywhere. It drove me crazy. The meticulous attention to detail was made all the more ironic by the decrepit looking Kyat that only my crispest U.S. dollars would be exchanged for. 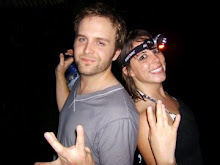 Kyat were frequently taped together and falling apart. Since there are no ATMs in the entire country and credit cards are essentially useless, it is easy to be put in a very uncomfortable situation. I suggest bringing Baht for insurance since the Thai currency is not scrutinized at all and is generally accepted at a decent rate. Reaching Bagan requires some motivation, but the journey is worth it. First, one must travel to Burma’s old capital, Yangon (Rangoon). This is possible and cheap on Air Asia and can be accomplished from either Bangkok or Kuala Lumpur. Alternately, JetStar flies to Yangon from Singapore. Once in Yangon, traveling to Bagan can be accomplished by domestic flight, bus, or train. Flights can be purchased at Yangon airport or through a tour company in advance for under $100 each way. The flight takes under one hour. While several airlines exist, I prefer Air Bagan. By train, the journey departs in the afternoon and arrives the morning of the following day. For train timetables, check the man in seat sixty-one. If you are really a sucker for torture, take the overnight bus from Yangon to Bagan. Both train and bus tickets can be purchased at the Yangon train station. Upon arrival, all visitors are required to purchase a $10 ticket for entry to Bagan. Very useful and informative blog post! It is very helpful for many travelers who are interested to go for Myanmar tour. 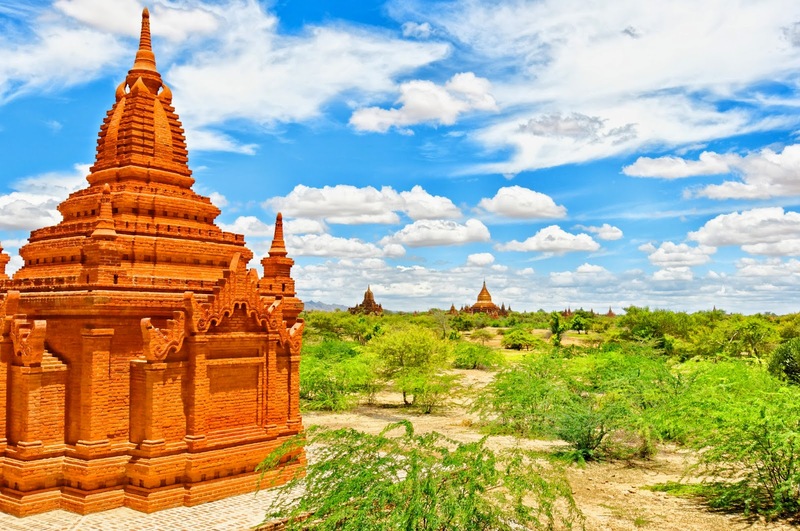 After visiting this blog I also wish to go to Bagan and curious to visit the Shwezigon Pagoda, Ananda Temple, Dhammayangyi, and Thatbyinnyu because I love to visit different religious and historic buildings. Justin Delaney! Let me know can we visit these temples in one day? I am interested to go there after completing my weekend thousand island tour. Consequently, the marketplace with regard to inexpensive reproduction purses offers consumed chanel replica substantially as well as nowadays there are numerous companies that provide females the chance to look with regard to excellent searching handbags as well as totes from extremely sensible costs, fake chanel certainly a great deal less expensive compared to originals. replica hublot The actual custom replications . marketplace has had excellent impetus when the Web grew to become the main buying path with regard to most customers globally. prada replica It’s already been many years because online retailers took more than the ones started embracing the net whenever looking for practically every thing, through info as well as providers in order to items of types. replica hublot Nevertheless, the style business has become the 1 the majority of suffering from the internet buying pattern, because clothes shops as well as footwear as well as add-ons web sites would be the the majority of frequented through customers through worldwide, regardless of whether ladies or even males. Cerita ini telah dikumpulkan dari berbagai sumber dan imajinasi sendiri, untuk itu jika Anda ingin tertawa Anda tetap bisa membaca berulang-ulang. Jika Anda tidak keberatan, Anda bisa juga mengirimkan hal-hal lucu kepda kami, atau kunjungi situsnya disini. Banyak orang berpikir dan selalu beranggapan bahwa mengenal lebih banyak orang akan memberikan peluang untuk membuka jaringan yang lebih luas. Namun terkadang lupa cara mengenal diri sendiri sehingga potensi maupun kelemahan tidak teridentifikasi dengan baik. Namun dalam banyak kasus, mencintai orang lain tanpa mencintai dirinya terlebih dahulu merupakan akar dari rasa cinta itu sendiri. Hal inilah yang akan berdampak dengan kelangsungan hubungan suatu individu atau kelompok. Dibawah ini terurai bagaimana cara mencintai diri sendiri (seperlunya) sebelum mencintai orang lain, simak ulasan selengkapnya. Setalah Anda membaca dan merenungkan, mudah-mudahan Anda memperoleh pemahman yang baik tentang diri dan potensi Anda. thank you for sharing... great post!!! Dewasa ini, untuk mengetahui harga pasar sebuah properti kita cukup mengaksesnya melalui internet atau halaman pencarian google. Informasi umum seputar property ataupun secara khusus di wilayah tertentui seperti di pontianak sudah termuat dengan baik. Selain itu, Anda juga bisa mengetahui informasi harga jual rumah di pontianak tersebut melalui sosial media atau website yang khusus mengulas property dan tips seputar hunian. Sebelum melihat langsung, Anda bisa melihat-lihat sejumlah pilihan hunian atau investasi yang menguntungkan bagi Anda. Silahkan kunjungi juga situs tentang informasi jual beli properti di pontianak disini. Pengembangan diri merupakan investasi terbaik dalam hidup, tak mudah tergerus inflasi, tergerus zaman dan era digiral. Pengembangan diri sangat penting untuk dilakukan sejak diri, untuk itu diperlukan kesadara diri yang seutuhnya. Setelah Anda membacanya, silahkan praktekan apa yang menurut Anda sesuai dengan kenyataan hidup ANda, jika ada yang kurang berkenan silahkan kasih masukan kepada saya demi perbaikan. through the use of a site. More than likely you’ve never got to know all of us. Kehidupan mengalir bagaikan air, kadang terhambat oleh tumpukan jerami yang jatuh dan tersangkut dibebatuan. Batunya tak harus dibersihkan melainkan jeramilah yang harus di bersihkan dari aliran sungai agar tidak lagi terhambat alirannya. Itulah bejana kehidupan yang mengalir bagaikan ngarai. Kehidupan juga bagaikan sinar mentari, kadang terhalang dedaunan yang rimbun hingga tebalnya kabut awan yang menutupi. Namun pada waktu yang terus berputar, semua bisa berlalu. Daun mengering dan awan ikut beranjak ke tempat lain seolah menuju pedaruan. Temukan pencerahan hidup dengan bacaan yang menarik dan inspiratif DISINI. When editing audio files, you can cut, copy and paste parts of recordings. You can also add effects like echo, amplification and noise reduction in your recording. Sharing this Obat benjolan di pergelangan tanganObat ginjal bengkak rise Obat benjolan di leher sebelah kanan nice Obat Uci uci bye Obat myasthenia gravis down Obat lebam memar bengkak dan lecet let Obat rahang kaku dan bengkak up Obat Limpa bengkak story Obat Bopeng Thank you very much..
pdf2cad 11 Crack Full is an easy-to-use yet powerful and efficient tool which converts your PDF, EPS or AI into editable CAD drawings. Global Mapper 19.1 Crack – is a good and all in one software for GIS application that offers full access to an unparalleled variety of spatial datasets and provides just the good level of functionality to satisfy both experienced GIS professionals and beginning users. Microsoft Office 2010 Download Very nice post and right to the point. also, see other posts really good content I find here. Thank you.